Leash ‘em in the snow. When snow storms hit, it’s best to keep your dog on a leash. Ruff Wear cites a source that says more dogs are lost during the winter months than during any other season. Dogs can lose their bearings when the weather turns nasty, so keep identification tags on at all times. Water in the cold. When you’re out on the trail this winter, don’t expect your dog to find their own water source. Eating snow isn’t an acceptable way to take in water either. Make sure to carry extra H20 and a collapsible water bowl in your pack. Dog booties. During the colder months, outdoor surfaces may contain any number of harsh substances that could irritate dogs’ paws. 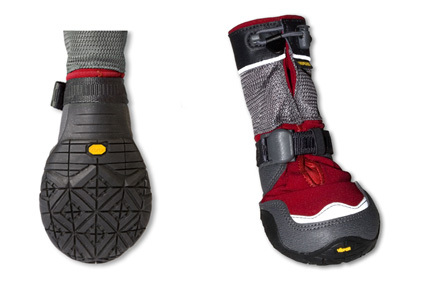 A product like Ruff Wear’s Polar Trex dog boots not only provide excellent traction on snow and ice, they can protect paws from harmful chemicals like salt and antifreeze on winter sidewalks and roads. Fur considerations. Short-haired dogs like my Weimaraner often need an additional layer to keep their core temperature in a healthy range. A dog coat is a must-have for breeds not equipped to handle winter’s lowest temps. 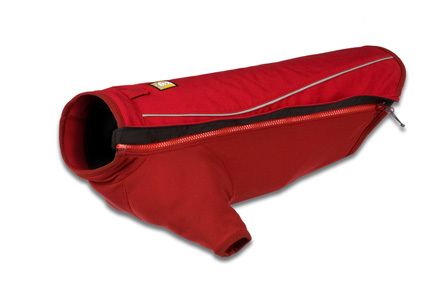 One option is Ruff Wear’s Cloud Chaser, a softshell zip-on that repels wind and moisture while helping a dog stay warm.